Unit 42 recently identified a variant of MNKit-weaponized documents being used to deliver LURK0 Gh0st, NetTraveler, and Saker payloads. The documents were delivered to targets involved with universities, NGOs, and political/human rights groups concerning Islam and South Asia. Reuse of this MNKit variant, sender email addresses, email subject lines, attachment filenames, command and control domains, XOR keys, and targeted recipients show a connection between the different payload families delivered. MNKit is the name given to a builder that generates CVE-2012-0158 exploit documents. The documents are in MHTML format and install a malicious payload on the compromised host. We believe MNKit is privately shared between multiple attack groups, but is not widely available. For more details on MNKit, see the Sophos publication, Office exploit generators. Typical MNKit MHTML files have used User123 or User323 as the Author and LastAuthor element values within their DocumentProperties sections and C:/2673C891/Doc1.files/ as a file directory location. 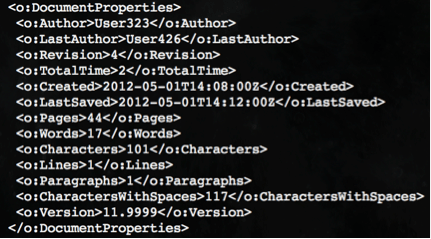 The samples discussed in this blog use User323 and User426 as Author and LastAuthor element values and C:/23456789/Doc1.files/ as a file directory location. http://www.amerikauyghur[. ]top and dge.123nat[. ]com are two command and control domains resolved by the malware. The first domain was previously mentioned by Arbor Networks in a report detailing the targeting of Tibetan, Hong Kong, and Taiwanese interests in their report, The Four-Element Sword Engagement. A subdomain of 123nat[. ]com, manhaton.123nat[. ]com, was also referenced in Arbor’s report as a LURK0 command and control domain. Below shows theLURK0 string used in the first five bytes of an implant beacon. Saker, often also called ‘Xbox’ and ‘Mongall’, is a malware family used by targeted attack groups who have also deployed NetTraveler and Gh0stRAT. Saker samples construct strings during execution. One such string is the origin of the malware’s name. The Saker PEs also contain a user agent strings (also constructed manually during execution) of Mozilla/4.0 (compatible; MSIE 8.0; Windows NT 5.1; .NET CLR 1.1.4531) and Mozilla/6.0 (compatible; MSIE 9.0; Wis NT 8.1; .NET CLR 2.13431). This second user agent is similar to the user agent, <code>Mozilla/4.0 (compatible; MSIE 6.0; Wis NT 5.0; .NET CLR 1.1.4322), as outlined by FireEye in 2014. amerikauyghur[. ]top overlaps with the LURK0 samples previously mentioned. Bothonebook[. ]top (registered with a registrant email address of interestbook@sina.com and bsnl.wang (registered with a registrant email address of jgjop@yahoo.com) have resolved previously to 103.232.222[.]20. These samples beacon to http://www.togolaga[. ]com (103.246.246[. ]221) and unisers[. ]com (123.254.104[. ]32) which respectively were mentioned by the Sophos Rotten Tomatoes publication. notebookhk[. ]net, also mentioned in the Rotten Tomatoes report, was at one point a known PlugX command and control domain. This domain as well as http://www.dicemention[. ]com are noted Korplug (often used to load PlugX) domains outlined by ESET in a blog post here. These domains as well as other overlapping indicators, such as the export function nameJustTempFun, were discussed by ProofPoint in a 2015 publication on PlugX targeting Russian military and telecom organizations and by Kaspersky in part 1 of their publication on NetTraveler. NetTraveler is a backdoor used to install other malware, steal information, and provide remote control of a compromised system. The targets previously mentioned by Kaspersky Lab of the NetTraveler operators aligns closely with the recipients of a new set of samples. The fslapi.dll files load their accompanying fslapi.dll.gui files that are XOR encoded. The decoded fslap.dll.gui DLLs include the following embedded URLs, the first of which was previously documented by Unit 42 as a red herring within NetTraveler samples. another sample of this MNKit variant. Tassnews[. ]net was registered with a registrant email address of ghjksd@gmail[. ]com and info-spb[. ]com was registered with a registrant email address of kefj0943@yahoo[.]com.Riaru[. ]net was registered with a registrant email address of fjknge@yahoo[. ]com on 29 March 2016, which also registered one other domain name, yandax[. ]net, on 16 June 2016 using the same authoritative DNS servers and registrar. Interfaxru[. ]com was registered with a registrant email address of ganh@gmail[. ]com on 18 April 2016 using the same registrar and authoritative DNS servers as riaru[. ]net and yandax[.]net. Only one domain name is currently registered byganh@gmail[. ]com, however it would be no surprise if an additional domain is registered by this registrant in the near future. While MNKit has been associated with multiple different groups the reuse of domain names, IPv4 addresses, phishing themes, XOR schemes, and email accounts are strong evidence for linkage between these new attacks and the previously documented ones. The change in PE SFX contents over the three sets of SFX PE files between February 2016 to March 2016, March 2016 to April 2016, and April 2016 to June 2016 time frames show a slight deviation is payload but consistencies in delivery methods. The best defense against MNKit is to ensure your systems are patched for CVE-2012-0158, but in situations where this isn’t possible, exploit mitigation technology like Traps is warranted. While attribution is a challenging art, it’s likely whoever is behind these recent attacks is, through infrastructure, malware families and delivery techniques, somehow related to the previously reported attacks. The attackers have been active for years, will likely continue to be active, and seem to prefer to change tactics only subtly.